Detroit: more than a ruined city. Credit: Melissa García Lamarca. All rights reserved. What’s the first thing that comes to mind when you hear the word “Detroit?” Government bailouts for the auto industry, perhaps? A ruined city that has largely been abandoned? Or maybe the “cheap suits” from Chevrolet who shot Kenny in the face during a duck-hunting expedition from "Motor City?" (see last week’s episode of Mad Men). We’re fairly sure it won’t be a vision of urban transformation, yet Detroit is full of people who are nurturing their communities and translating that spirit into a different form of city politics. It’s true that Detroit has hit hard times. Seventy thousand structures stand vacant in a city left behind by car-makers seeking cheaper labor and higher profits in locations where labor unions are weaker. Despite a public vote against it, Michigan’s Governor Rick Snyder has appointed a controversial Emergency Manager for the city with the power to override decisions that are made by democratically-elected officials. While a recent influx of non-profit and private resources has led to gentrification in certain districts (notably Midtown, a business and cultural hub near the center of the city), many of Detroit’s most marginalized residents are seeing the services they depend on disappear, including public transport. The demand for community organizations to step in and fill the gaps created by these cuts is growing by the day. So what has been their response? Like any authentic process of transformation, this one starts from the bottom up. Take the example of the hot breakfast program at St. Matthew’s and St. Joseph’s Episcopal Church, which was initially designed to provide meals for parishioners attending early-morning services on Sundays. After the church stopped offering an early service, volunteers took over the management of the program and re-directed it to local residents who are not affiliated with the church. Alethea Belfon, one of the volunteers, says that they “wanted to create a sense of caring for one another and to try to help develop a sense of community,” thereby tapping into a much broader social change goal than simply providing food. But how could such a sense of community be nurtured in a program designed to help those who simply needed an extra meal? Alethea and her colleagues realized that the way in which the food was served and shared could influence how people interacted with and related to one another. Traditionally, meals were served by having people line up as in a cafeteria (or a depression-era breadline). The volunteers tested a range of different alternatives, ultimately settling on a family-style approach in which groups of four people sit together and serve themselves from common bowls. The shift to family-style eating helped people to engage with each other in ways that hadn’t occurred before. Alethea also noticed that the sense of individual isolation that had characterized many of the diners began to melt away. People started talking to each other, exchanging ideas and opinions, and strategizing about the problems and opportunities of the city. And that’s where this story gets really interesting. Not only are more of the diners getting involved in running the breakfast program, but they are also beginning to organize themselves and others around the issues facing their communities. When a proposed light-rail plan threatened to reduce bus services for all Detroiters, those involved with the breakfast program held a meeting at the church that led to the creation of the North End Woodward Community Coalition. This new coalition brings residents together with faith-based organizations and community businesses to lift up the concerns of people who depend on public transport. Right now the Coalition’s work is particularly important, because planners and developers are shifting their focus away from sustaining the transit infrastructure for the current population of Detroit. Instead, they want to concentrate on targeted investments in “transit-oriented development” that are designed to lure in new business. And as this process unfolds, the Coalition has become a critical voice for equity and justice in the city’s transportation system. St Matthew’s and St Joseph’s is not an isolated example. At the Building Movement Project we are documenting many other organizations that support personal growth and development in the service of broader social change. The efforts of these groups demonstrate how seemingly innocuous changes in the ways in which people relate to each-other at the grassroots level can have much larger and potentially transformative effects higher up the system. Something as simple as a shift to family-style eating at St Josephs has helped people to foster a stronger sense of community and love for their neighbors. And in that process they not only care and advocate for one another, but they also develop the capacities and confidence required to participate in re-shaping the wider environment. 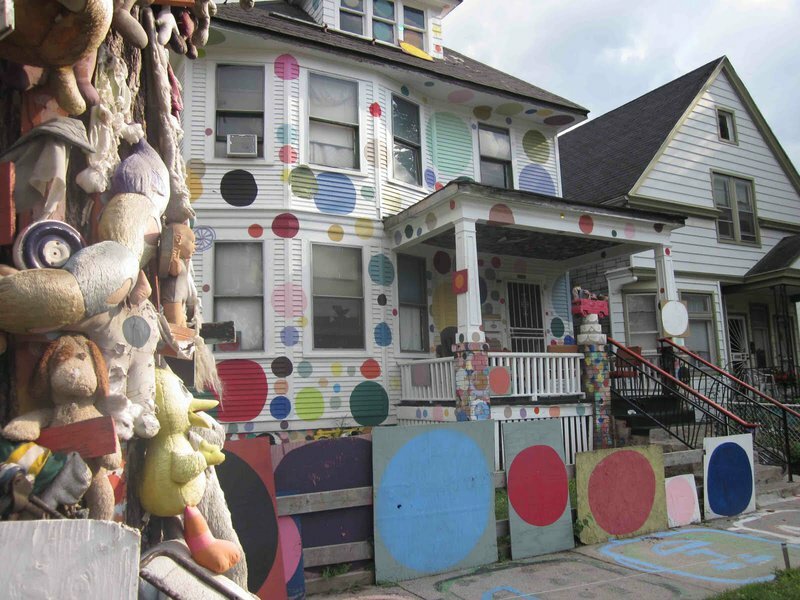 As a result, organizations across the city are starting to create the kind of community they envision for Detroit as a whole: one that is characterized by mutual aid, sharing and abundance. Maybe the next time you hear about the Motor City and its problems you’ll think about transformation, not ruin and abandonment.